Events and activities of the Prophet Joseph Smith’s years along the Susquehanna helped mold his life and the future of the Church. The years 1825 through 1831 on the land along the Susquehanna River near Harmony, Pennsylvania, proved to be a time of growth and chastisement as well as great joy and sorrow for the Prophet Joseph Smith. It was here in 1825 that 19-year-old Joseph worked, obtained some schooling, and met, courted, and married his future wife, Emma Hale, daughter of Isaac and Elizabeth Hale. Together they suffered the death of their first child. Here much of the Book of Mormon was translated, the Aaronic and the Melchizedek Priesthoods were restored, and 15 sections of the Doctrine and Covenants were received. Map: Significant events occurred in or near South Bainbridge (now known as Afton) and Colesville Township, New York, and Harmony, Pennsylvania (now known as Oakland). South Bainbridge and Colesville are about three and a half miles apart, and Colesville is about 27 miles from Harmony. Joseph Smith traveled by horseback, by carriage or sleigh, and on foot between South Bainbridge, Colesville, and Harmony and often was accompanied by Emma, Oliver Cowdery, Joseph Smith Sr., Josiah Stowell, Joseph and Newel Knight, or the Whitmers. Connecticut-born Isaac Hale left Vermont in about 1787. Journeying through the state of New York, he descended the Susquehanna River as far as the “great bend.” Finding the country much to his liking, he returned to Vermont and married his sweetheart, Elizabeth Lewis. The happy couple then joined company with Elizabeth’s brother, Nathaniel C. Lewis, and his new wife, Sarah Cole, for the return trip in about 1790. Placing their belongings in a cart pulled by a yoke of steers, the brothers-in-law took their wives on a 220-mile emigrants’ journey from Wells, Rutland County, Vermont, to sparsely settled Willingborough, Luzerne County, Pennsylvania.1 Isaac and Elizabeth located on the north side of the Susquehanna. The area eventually became Harmony Township, which was attached to Susquehanna County in 1810. Isaac and Elizabeth became the parents of nine children: Jesse, born 24 February 1792; David, born 6 March 1794; Alva, born 29 November 1795; Phebe, born 1 May 1798; Elizabeth, born 14 February 1800; Isaac Ward, born 11 March 1802; Emma, born 10 July 1804; Tryal, born 21 November 1806; and Reuben, born 18 September 1810.4 Isaac’s ability as a farmer and his prowess on the hunt, coupled with the domestic skills of Elizabeth, provided the children with a comfortable existence. Isaac Hale said that Stowell and his men arrived at his home in November 1825. Their dig located up Flat Brook beneath Oquago Mountain was short lived, reported by Isaac to have ended about 17 November.6 The Prophet said of Josiah Stowell’s search for wealth, “Finally I prevailed with the old gentleman to cease digging after it” (JS—H 1:56). Going initially to the home of Josiah Stowell, Joseph and Emma then visited the village of South Bainbridge where arrangements were made for their marriage before Esquire Zachariah Tarble, Justice of the Peace. The ceremony was performed on 18 January 1827 at the Tarble home, located on the east side of the Susquehanna River. It is probable that Josiah Stowell was among those who witnessed the marriage because he had encouraged Emma to unite with Joseph. Before the marriage Joseph had informed his own parents, Joseph Sr. and Lucy Mack Smith, of his plans and asked their blessing in the matter. Lucy said that “we were pleased with his choice, and not only consented to his marrying her, but requested him to bring her home with him, and live with us.”10 Having no conveyance of his own, the Prophet accepted Josiah Stowell’s offer to take the newlyweds by wagon to the Smith frame home in Manchester. Here Joseph had a brief respite and farmed that season with his father. From Manchester, Emma wrote to her father in Harmony asking “whether she could take her property, consisting of clothing, furniture, cows.” Isaac responded that “her property was safe, and at her disposal.”11 Peter Ingersoll, a neighbor of the Smiths, was hired to take them to Pennsylvania in his wagon during August 1827. Peter said that as they drove into the yard, Father Hale came out in an agitated state and amidst a “flood of tears” confronted Joseph for having “carried away” his daughter. However, before their return to Manchester, Isaac asked Joseph to move to Harmony and said he “would assist him getting into business.”12 Given the severity of the situation which soon developed in the Manchester–Palmyra area because of the intensity of the mob action, this offer shortly became an important option for the besieged Prophet. Joseph Smith Sr. requested that his son inquire of the Lord as to what he might do to qualify himself for the work of the kingdom. Doctrine and Covenants 4 was the resultant revelation, which became a personal guide to that grand patriarch and to countless others across the years. He was instructed that those who would “embark in the service of God” must possess certain godly attributes, among which “faith, hope, charity and love, with an eye single to the glory of God, qualify him for the work. “Remember faith, virtue, knowledge, temperance, patience, brotherly kindness, godliness, charity, humility, diligence. “Ask, and ye shall receive; knock, and it shall be opened unto you” (D&C 4:2, 5–7). His supplication was heard, for Oliver Cowdery, a schoolteacher in Manchester District 11, was given a heavenly manifestation of the validity of the work while boarding at the Joseph Smith Sr. home. The Prophet recorded, “The Lord appeared unto a young man by the name of Oliver Cowdery and showed unto him the plates in a vision and also the truth of the work and what the Lord was about to do through me, his unworthy servant; therefore, he was desirous to come and write for me.”26 Oliver then made arrangements to accompany the Prophet’s brother Samuel, who was on his way to Harmony in the forepart of April 1829. Oliver said to Joseph’s parents, “I have now resolved what I will do for the thing which I told you seems working in my very bones insomuch that I cannot for a moment get rid of it.”27 The pair went by way of Oliver’s friend’s place, David Whitmer’s home in Fayette, New York, and arrived in Harmony on 5 April 1829. Oliver was fully satisfied that his assistance as scribe was a direct call from the Lord and commenced his labors with Joseph on 7 April. “I shall not attempt to paint to you the feelings of this heart, nor the majestic beauty and glory which surrounded us on this occasion; but you will believe me when I say, that earth, nor men, with the eloquence of time, cannot begin to clothe language in as interesting and sublime a manner as this holy personage” (note to JS—H 1:71 on page 59). The Prophet requested Oliver to write to his friend David Whitmer in Seneca County, New York, to see if the Whitmers could provide them a safe place to complete their labors with the gold plates. 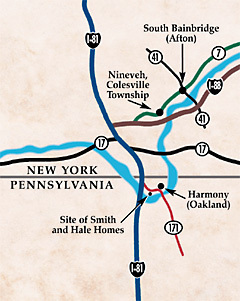 In an affirmative response, David Whitmer went to Harmony in the latter part of May 1829 and conveyed them to his father’s log home in the rural setting of Fayette Township by 1 June. During the month of June the translation was completed, a copyright filed, and initial arrangements commenced for printing the Book of Mormon. Newel Knight was apparently the first of his family and the Colesville Saints to join the Church. During the last week in May 1830 he visited the Whitmer farm in Fayette and was baptized by David Whitmer. Most Knight family members and friends, however, were converted and baptized near their homes. While the Prophet Joseph Smith was detained by the court officers, Emma found some comfort at the home of her sister, Elizabeth Hale Wasson, who lived in the adjoining township of Windsor with her husband, Benjamin. We do not know for a certainty the exact building sites where the Prophet’s trials were held other than their taking place in the village of South Bainbridge and somewhere in the town of Colesville. Joseph was exonerated of the charges in both instances. Joseph Knight Sr. stated, “They could find no thing against him; therefore he was dismissed.”35 The moment he was free to go his way, he went directly to the Wasson home in the town of Windsor and took Emma to the welcome shelter of their homestead in Harmony. The spirit of revelation was again manifest at Harmony as the voice of the Lord was given through His servant Joseph Smith unto “Emma Smith, my daughter” in July 1830. The Lord addressed Emma as an “elect lady” and called her to the work.36 Amidst the blessings and admonitions that followed, Emma was given the charge to “make a selection of sacred hymns, as it shall be given thee, which is pleasing unto me, to be had in my church”﻿—a command which was later carried out in 1835 during the Kirtland period (see D&C 25). Once again the clamor of Joseph’s enemies in Harmony became such that he and Emma responded to the invitation of the Whitmer family to stay with them. At the end of August 1830 they made their move. For Emma it was a particularly heartrending moment. As circumstances developed this proved to be the last time that she would share the embrace of her parents or visit the grave of her infant son. The Prophet did return briefly one last time to the Susquehanna area as an outgrowth of an assignment from the Lord that he and Sidney Rigdon not go to the Ohio “until ye have preached my gospel in those parts, and have strengthened up the church withersoever it is found, and more especially in Colesville; for, behold, they pray unto me in much faith” (D&C 37:1–2). In January 1831 the Prophet and Sidney Rigdon went to Colesville and held several gatherings at Joseph Knight Sr.’s home. John Whitmer informed us that “they held prayer meetings, among the disciples, and they also held public meetings but it was all in vain, they [enemies of the Church] threatened to kill them.”38 Joseph Knight Sr. said that the Prophet and Sidney not only came to Colesville but also made a hurried trip “down to Harmony to settle some business.”39 This was the last visit of the Prophet to the Susquehanna area. Joseph Knight Sr., a great friend and benefactor of the Prophet Joseph, continued to assist. He took the Prophet and Emma from New York to Kirtland, Ohio, during January–February 1831. He also conveyed his own wife and an unmarried daughter, Polly, with him. Brother Knight never looked back but said good-bye to his Colesville property with its “one hundred and forty-two acres, … two dwelling houses, a good barn, and a fine orchard,”40 linking himself unequivocally with the Prophet Joseph and the earliest scenes of the Restoration. Some 68 members of the Colesville Branch followed him to Ohio in April–May 1831. There is still a spirit of peace that lingers over the banks of the “great bend” of the Susquehanna and its environs. The lives of those Saints who embraced the unpopular new religious cause in that quarter were irreversibly changed. During the call to “assemble together at the Ohio” (D&C 37; see also D&C 38:32), it is sad that for a multiplicity of reasons some members fell by the wayside and remained behind. However, the majority chose to ally their fortunes with the Church, and they and their numerous posterity now enjoy the everlasting blessings of the covenants they kept with the Lord. Emily C. Blackman, History of Susquehanna County, Pennsylvania (1873), 103. George Peck, The Life and Times of Rev. George Peck (1874), 67–68. Blackman, History of Susquehanna County, 103–4. Mary Audentia (Smith) Anderson, Ancestry and Posterity of Joseph Smith and Emma Hale (1929), 304–5, 308. Lucy Mack Smith, Biographical Sketches of Joseph Smith the Prophet and His Progenitors for Many Generations (1853), 91–92; JS—H 1:56; Baptist Register, Utica, New York, 13 June 1834, 68. Susquehanna Register, Montrose, Pennsylvania, 1 May 1834. In Dean C. Jessee, “Joseph Knight’s Recollection of Early Mormon History,” BYU Studies, autumn 1976, 32; spelling, capitalization, and punctuation modernized. Susquehanna Register, 1 May 1834. Oath made by Peter Ingersoll before Judge Thomas P. Baldwin, 9 Dec. 1833, Wayne County, New York, Court. JS—H 1:59; Smith, Biographical Sketches, 99–100; Jessee, “Joseph Knight’s Recollection,” 32–33. Larry C. Porter, “A Study of the Origins of the Church of Jesus Christ of Latter-day Saints in the States of New York and Pennsylvania, 1816–1831” (Ph.D. diss., Brigham Young University, 1971), 132–34. JS—H 1:63–65; Pomeroy Tucker, Origin, Rise, and Progress of Mormonism (1867), 41–42. Dean C. Jessee, ed., The Papers of Joseph Smith, 2 vols. (1989–92), 1:9–10. Emma Smith’s family Bible in possession of Buddy Youngreen; see also Ensign, Mar. 1981, 62–64. Jessee, The Papers of Joseph Smith, 1:10; D&C 3, 10. Smith, Biographical Sketches, 126; Jessee, The Papers of Joseph Smith, 1:10; Saints’ Herald, 1 Oct. 1879, 289. Jessee, The Papers of Joseph Smith, 1:10; spelling, capitalization, and punctuation modernized. Jessee, The Papers of Joseph Smith, 1:10. Lucy Mack Smith, “Preliminary Manuscript,” 98, Historical Department Archives, The Church of Jesus Christ of Latter-day Saints; hereafter cited as Church Archives. Jessee, “Joseph Knight’s Recollection” of Early Mormon History, 36; spelling, capitalization, and punctuation modernized. See also Larry C. Porter, “The Restoration of the Aaronic and Melchizedek Priesthoods,” Ensign, Dec. 1996, 30–47. Letter of Joseph Smith Jr. to Oliver Cowdery, Harmony, Pennsylvania, 22 Oct. 1829, Church Archives; Jessee, “Joseph Knight’s Recollection,” 36–37; Wayne Sentinel, Palmyra, New York, 26 Mar. 1830. History of the Church, 1:81–82. “Newel Knight Journal,” Church Archives; Porter, “A Study of the Origins of the Church,” 198–203. Joseph Knight Jr., “Joseph Knight’s Incidents of History from 1827–1844,” Church Archives, 2. Jessee, “Joseph Knight’s Recollection,” 38; spelling, capitalization, and punctuation modernized; History of the Church, 1:87–96. When the Relief Society was organized in Nauvoo on 17 March 1842 the Prophet declared that this was a direct fulfillment of the promise Emma had been given relative to the “elect lady” designation in D&C 25 (see Jill Mulvay Derr, Janath Russell Cannon, and Maureen Ursenbach Beecher, Women of Covenant , 10). “Newel Knight Journal,” Church Archives. Book of John Whitmer, BYU Archives and Manuscripts, 3. Jessee, “Joseph Knight’s Recollection,” 38; spelling, capitalization, and punctuation modernized. Porter, “A Study of the Origins of the Church,” 296–311. History of the Church, 5:107. Larry C. Porter, a member of the Grandview 15th Ward, Provo Utah Grandview South Stake, is a professor of Church history and doctrine at Brigham Young University. Aerial view of Hale and Smith homesteads. Looking toward the west, one can see the Harmony Church history sites as they appear today. From left to right: (1) Susquehanna River winding past the homesteads; (2) area near where the Aaronic Priesthood was restored; (3) present-day railroad tracks separating the river from the Smith and Hale homesites; (4) Hale homesite; (5) site of the Smith home; (6) site of Aaronic Priesthood Restoration Monument; (7) State Highway 171 running between the Smith and Hale homesteads; (8) the McKune Cemetery and gravesites of Isaac Hale and some other family members.